Where Do Rehabilitation Nurses Work? Rehabilitation nurses help patients who have long-term physical disabilities or chronic illnesses and assist them with any personal limitations which might result from these disabilities. These nurses work with patients and families to create a personally tailored recovery plan. Rehabilitation nurses also help patients to set both long and short-term goals. As a rehabilitation nurse, your primary objective is to help your patients gain back their health and independence to the best of their ability. Many rehabilitation nurses work with patients on an on-going basis. Aside from the medical side of things, rehabilitation nurses must be supportive and encouraging, as the recovery process for many patients can be grueling and frustrating. They must gently guide their patients to push past their limits to reach goals. A positive attitude and an abundance of patience are excellent traits to possess for this role. Being a rehabilitation nurse can be incredibly rewarding, and it suited for those with a strong desire to help others and change lives. What Are the Educational Requirements for Rehabilitation Nurses? Whether it's obtaining a BSN (Bachelors of Science in Nursing) or an ADN (Associates of Science in Nursing), earning a nursing degree is the first step toward beginning a career as a rehabilitation nurse. Upon earning a nursing degree, you can then apply to take the NCLEX-RN licensing examination. Once this exam has been successfully passed, you will be eligible to apply for a registered nursing license via your state's nursing board. Additionally, there are continuing education courses that are available which introduce RNs to basic rehabilitation nursing concepts. Typically, advanced practice nurses will hold an MSN specific to their role as nurse practitioners (NPs) and clinical nurse specialists (CNSs). Currently, master's degrees specific to advanced practice rehabilitation nursing simply don't exist. Rehabilitation nurses can increase their employment opportunities and compensation by earning the Certified Rehabilitation Registered Nurse (CRRN®) credential. This distinction requires passing an exam and having two years' experience in rehabilitation nursing. Rehabilitation nurses can obtain their CRRN credential through the Rehabilitation Nursing Certification Board (RNCB), an independent auxiliary component of the Association of Rehabilitation Nurses. Requirements to sit for the exam include being in possession of an unrestricted license as an RN and one to two years of practice as an RN in rehabilitation nursing within the five years before applying. Rehabilitation nurses can also work for educational institutions or insurance companies. 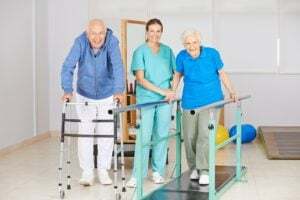 The goal of rehabilitation nursing is to assist individuals with a disability or chronic illness with attaining and maintaining maximum function. The rehabilitation staff nurse assists clients in adapting to an altered lifestyle while providing a therapeutic environment for clients and their families. They design and implement treatment strategies that are based on scientific nursing theory related to self-care that promote physical, psychosocial, and spiritual health. The rehabilitation staff nurse works in inpatient and outpatient settings that can be found in a range of acute to sub-acute rehabilitation facilities. What Are the Roles and Duties of a Rehabilitation Nurse? According to the United States Bureau of Labor Statistics, there are well over 2 million rehabilitation nursing and registered nursing positions spanning across the country. By 2020, this number is projected to grow by 19 percent-a faster than average growth. The demand for rehabilitation nurses should be at least equal to this rate. Typically, rehabilitation nurses will earn an average income of anywhere from $32.37 to $38.32 per hour, or approximately $65,470 per year.